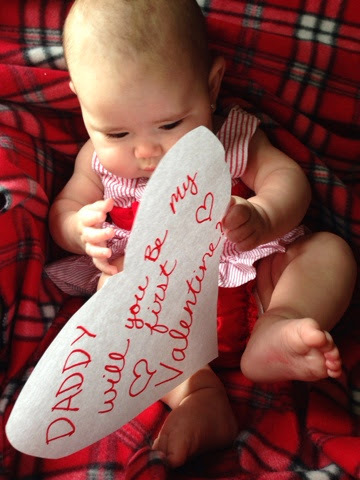 Little Charley Paisley and I did a Valentines day photo shot for her daddy! We hope he likes our homemade photo Valentine!! 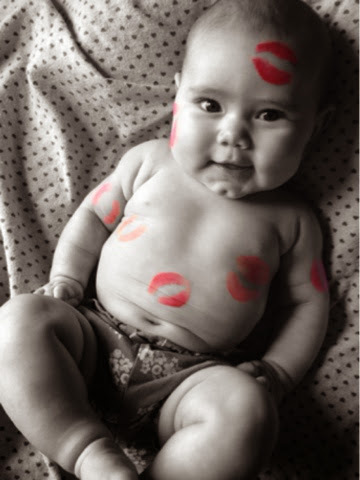 Kissable baby valentine for daddy. I just used bright red lip stick (I bought the cheapest red from the drug store). To keep the red bright red I would kiss Charley twice and then applied the lip stick again. All of these photos were just taken with my iPhone. FYI: the lip stick was hard to get off little Charley's skin we had to give her a bath after our photo shot. I took the colored photo and used a very cool app called color splash to make the kisses red. This photo is my favorite of the day!! Daddy will you be my first valentine? I used all Walgreens drug store app to order prints off my iPhone and picked up the photos an hour later.